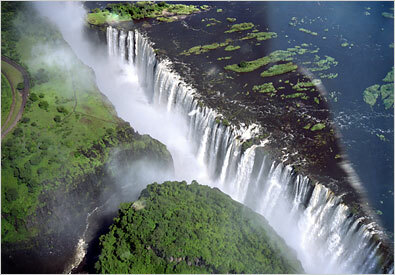 On the border between Zambia and Zimbabwe is claimed to be the largest waterfall in the world. It is 108 metres high and a 1708 metres wide, and has the largest screen of falling water in the world. It is also competing with the Niagra Falls for the largest flow rate. Victoria Falls has the record, but the Niagra Falls has a larger annual flow. The falls are a massive tourist attraction and tourist can travel freely between the two countries with a day visa. There are lots of wild-life activities connected to the falls. Safari is popular, one can Bungee Jump from the Victoria Falls Bridge, whitewater rafting. The most spectacular thing to do is possibly to swim in the Devil's Pool, just at the edge of the fall.